Q- What is a Carolina Dog? A- The Carolina Dog is a dog of medium build, possessing the general appearance of a small jackal or wolf in combination with many features of a small Sighthound. The distinctive features of the breed are those which confer survival advantages under free-living conditions in tallgrass savannah and bottomland swamp forest habitats of the southeastern United States. The dog typically has a medium-length straight back, with a distinctive waist which sets-off a deep brisket from a highly tucked-up loin. The tail is distinctive in both its fish-hook-like configuration and its variable carriage, depending on mood. The large, upright ears and long, graceful neck are also distinctive and suggest the appearance of a small, versatile and resourceful predator well-adapted to surviving on its own in a natural habitat. Q- Is a Carolina Dog the same as an Australian Dingo, a hybrid Aus. Dingo/cross, a wolf or coyote hybrid/cross or other type of wild canid? Q- Do Carolina Dogs have a viscous nature towards people? What about children? A- No Carolina Dogs may have a shy or suspicious nature and may take time to warm up to strangers, but they are not an aggressive dog by nature. Of course, common sense should dictate as with ANY dog, of ANY breed or mixture, and caution be taken when approaching or handling ANY strange dog. Many Carolina Dogs live in homes with children of all ages. 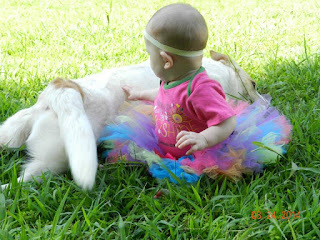 Many CDs are noted to love babies, some are not comfortable around small children, IMO it all depends on their socialization, and the introduction, common sense applies here, as with ANY breed, use caution when introducing any dog to a small child and make sure that child (if capable) knows how to approach and interact safely with a dog of ANY size/breed. Carolina Dogs are known for their pack mentality, as in that they bond with their pack and become very loving and loyal to their family of all ages, sizes, shapes, colors and species. 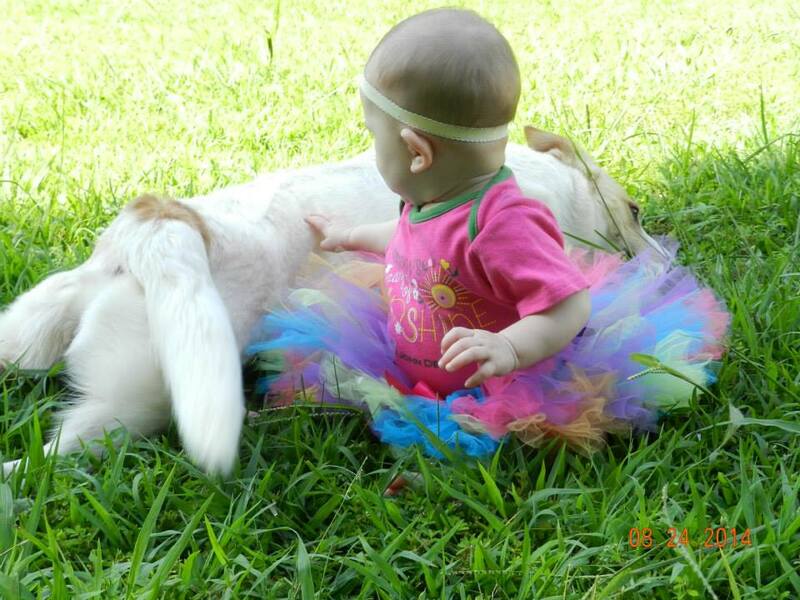 Q- Are Carolina Dogs aggressive towards other dogs, or other pets or farm animals? How about cats? Carolina Dogs are known to have a prey drive, so they may chase and attempt to kill smaller creatures than themselves, such as mice, squirrels, rabbits, snakes, chickens, etc. That does not mean that they cannot live with smaller creatures in the home. As stated in the prior question, Carolina Dogs have a very tight pack mentality, so any animal that is in the home and is properly introduced(in the correct way for a dog/critter introduction, not as humans are introduced, if you don't know how to do this get the advice of a qualified dog trainer) the Carolina Dog can live in harmony with, and will probably consider that animal(s) as a sibling. Many Carolina Dogs live with or near farm animals. My pack lives with a flock of free ranging chickens with no casualties. 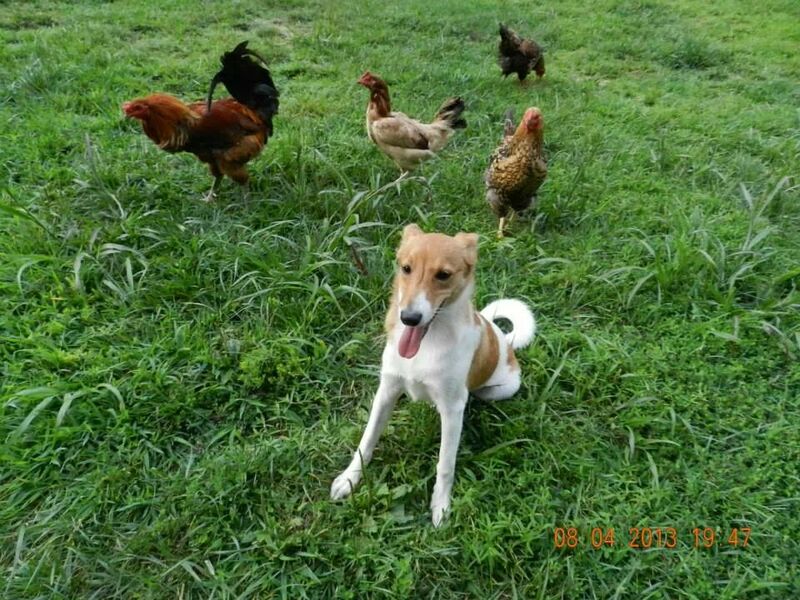 If your Carolina Dog attempts to chase or harass farm animals of similar or larger size to themselves, this is a behavior/training issue, and you may want to institute some training or if you feel you cannot handle the issue, call a professional. Yes, Carolina Dogs can live with cats as discussed above about proper introductions. Many Carolina Dogs currently live happily with cats. *This does not mean that every Carolina Dog will immediately get along with every animal in the home it is newly introduced to, every dog (of any breed/mix) is an individual as are the other animals involved as well. A trainer and patience may be needed when adding any new animal to a home with established pets. A- Yes CDs do shed,they are NOT a shed free dog, which is a myth. The CD has a double-coat, a dense soft undercoat & longer guard hairs over the top. This is a distinguishing feature of the breed. Its appearance is affected by the seasons. The winter coat is distinctly heavier than the summer coat. In the cooler months, there should be a wealth of undercoat. Animals showing excessive shedding at appropriate times of the year are not to be penalized." MY CDs do not shed excessively year round, so if your CD is shedding tons of fur all over the place year round, you may want to look into diet and environmental factors that can affect the coat & skin. Q- What diet should a Carolina Dog be fed? A- There is no such thing as a true breed specific diet. Many people feed many different styles, brands, and formulas of pet food. I think it is a pretty common practice that a Carolina Dog should at least be fed a grain free/limited ingredient high quality kibble diet. I personally, and professionally, feel that Carolina Dogs do best on a Species Appropriate Raw Food diet. I always advocate for any and all dogs to be fed a SARF diet. I personally believe in the raw diet so much that I only home my puppies to homes that will feed raw. Q- What does "Natural Rearing" or "Naturally Reared" mean? A- This means to raise a dog based upon the principles or Laws of Nature that God mandated: a SARF (Species Appropriate Raw Food) diet, Exersize, Pure Water, Fresh Air, Sunshine, Rest, All things in Moderation, And Trust in these laws to maintain health. This also means avoiding all toxins on, in or around the dog or it's environment. If the body does go out of balance, using Nature's remedies, such as Herbs, Oils, Classical Homeopathy, Chiropractic, Chinese Medicine, etc in addition to the laws of health to assist the body to bring itself back into balance. My dogs were began on the Natural Rearing path when I got them and all my puppies are completely raised this way. Q- Do you sell puppies to homes that do not want to raise their dog naturally? A- I prefer my puppies to go to homes that will continue with the Natural Rearing that I started and work so hard on. When I first started I was not as adamant about this, but after experience & education I have gained over the years I am very insistent on this point. I can refer anyone not wanting to Naturally raise their Carolina Dog to several different CD breeders or rescues that would have a Conventionally Raised puppy/dog for you. Q- Do you offer mentoring or teaching about Natural Rearing or the Raw Diet , especially for switching a dog that is currently on a kibble diet? Q- What are some nicknames that Carolina Dogs are known by? A- Carolina Dogs are also known to be called, as a slang or nickname: CD, CD/AD, American Dingos, Dixie Dingos, Yeller Dogs, Yaller Dogs, Indian Dogs, Southern Aboriginal Dogs, Porch Dogs, Ditch Dogs, Ol'Yeller Dog, Pariah Dog, Indian's Dog, Swamp Dog, Southern Dingo, also Upside Down Dingo( because of a propensity to sleep on their backs with all 4 paws in the air, lol) Shadows, God's Dog, and Man's Best Friend. These names don't mean anything about the genetics or behaviors of CDs (except where already noted, as in UDD) , they are just nicknames, slang, some are affectionate, some are put-downs, some are prideful and most are out of intense love and awe at being able to share our lives with these incredible creatures. 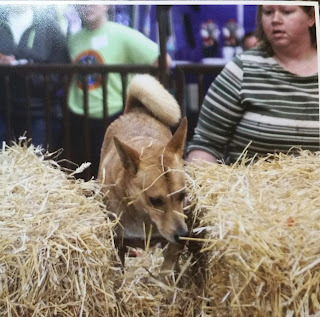 Because of negative connotations and the possibility of Breed Specific Legislation, the founder of the Carolina Dog breed and the official breed club prefers the Carolina Dog NOT be referred to as a "Dingo", "American Dingo" or "Dixie Dingo". As stated in an additional FAQ, the most current DNA research does not support the early theory that the CD is related to the Australian Dingo. Carolina Dogs also excel at being therapy, emotional support, guide, or service animals. CDs can track, and do scent detection(bomb, drugs, cell phones, people etc). 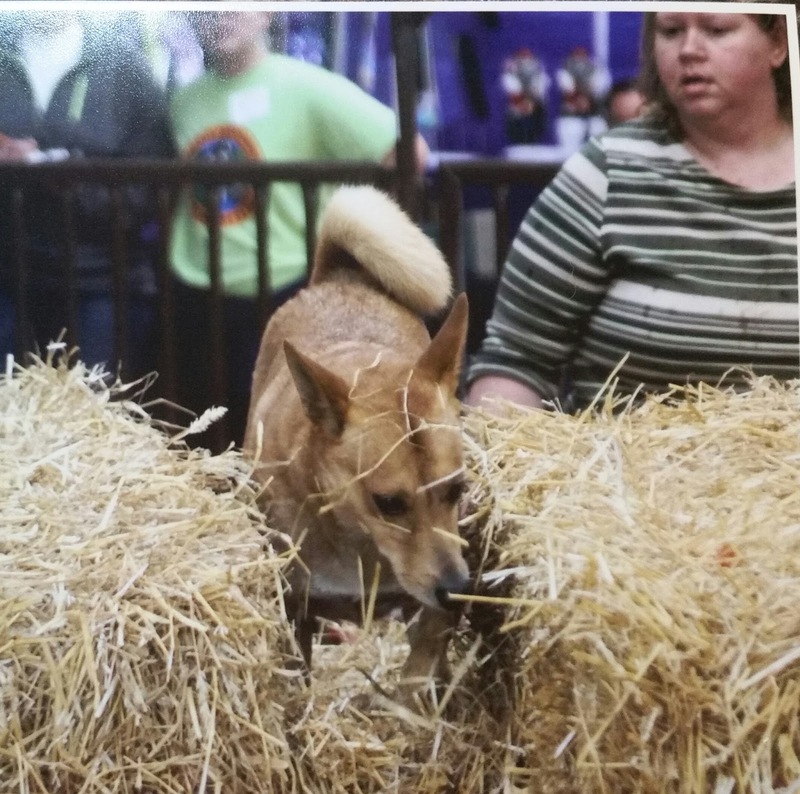 CDs excel in a myriad of dog sports such as Agility, Barn Hunt, Scent Work, Lure Coursing, Herding, Confirmation, and many more. Best of all, Carolina Dogs also excel at being your constant companion, whether you want to go running or hiking or you want to lay on the couch and watch a movie, they just want to be with you and to please you. So use your imagination and think up something fun for you and your Carolina Dog to do! 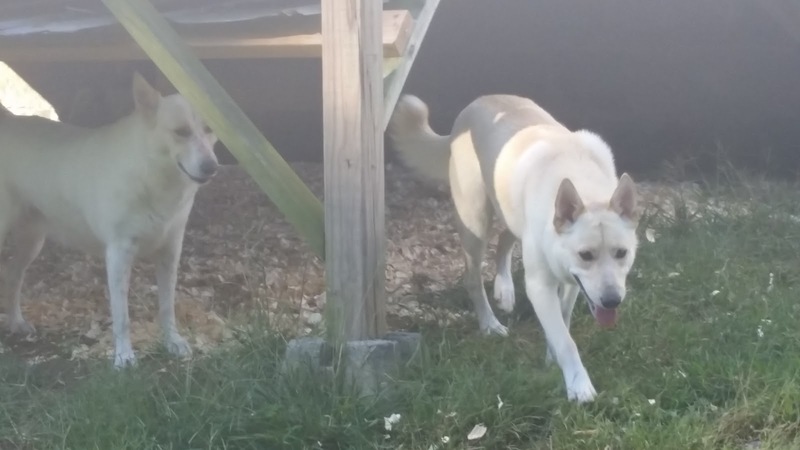 Q- Do Carolina Dogs have to live on a farm or in a rural setting? Can Carolina Dogs live in the city or in an apartment? A- Carolina Dogs can live and thrive anywhere their family is! CDs, especially young CDs, require lots of daily exersize and mental stimulation. I am not meaning playing fetch for a few minutes. A CD will need long walks every day and/or training sessions, brain-work or a job to do every day. If living in the city it would be a good idea to have a large area that you can take your CD a few times a week to be able to run (dog park, tennis court, park, hiking trails). I would not deny a good home to one of my CD puppies just because it is in the city or an apartment, but I would make sure that the family realized what would be involved in keeping their puppy from becoming bored and possibly destructive. Q- Do you offer a contract with your puppies? A- Yes, I do have a contract for each puppy I home. A SAMPLE CONTRACT is available on my website. Do you have a burning question about Carolina Dogs or Natural Rearing? A recent question I have had is "Do Carolina Dogs shed?" My Answer is: Yes CDs do shed,they are NOT a shed free dog, which is a myth. The CD has a double-coat, a dense soft undercoat & longer guard hairs over the top. I recently got a 1.5 year old dog from the local shelter. The shelter had identified her breed as a carolina dog. After reading what you say their temperment is and how rare they are, I am starting to doubt if she is a carolina dog. Is there anyway you could help me?